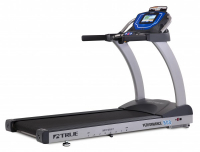 TRUE Performance 300 is a treadmill suited for users of all fitness levels. It is simple to monitor your progress on the Performance 300 with the easy-to-read LCD screen. The TRUE Performance 800 offers a customizable experience on one of the largest running surfaces in the industry. Up to 6 users can save their own custom profile information that can be easily accessed by tabs seen at the bottom of the console.